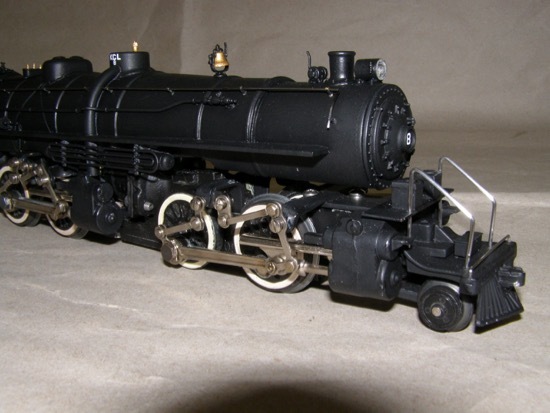 I have always been impressed with articulated locomotives. The really big ones are tremendous and often modeled. 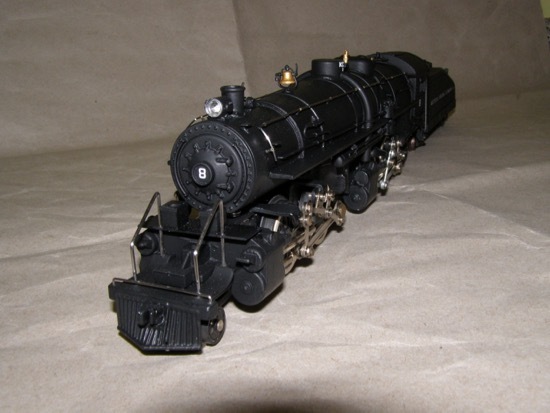 After finishing up a few projects I decided to try my hand with an articulated locomotive. 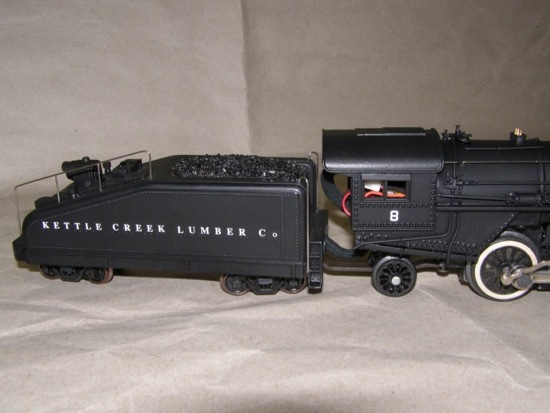 An additional interest of mine has been the logging railroads. 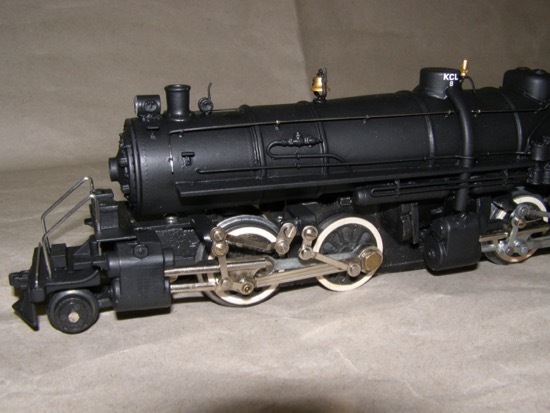 I find the smaller articulated made for some of these railroads very attractive. 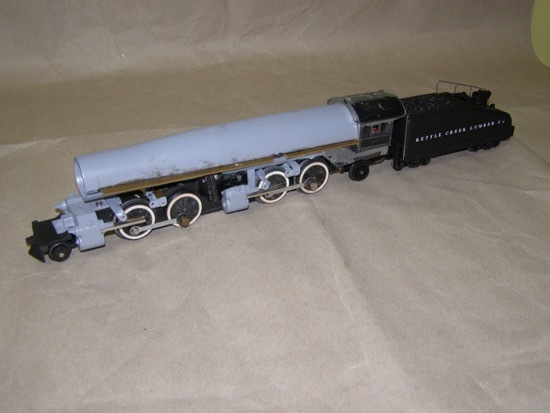 Since I am using parts from Gilbert locomotives I am constrained by the size of the drivers, which affects the size of the finished locomotive. 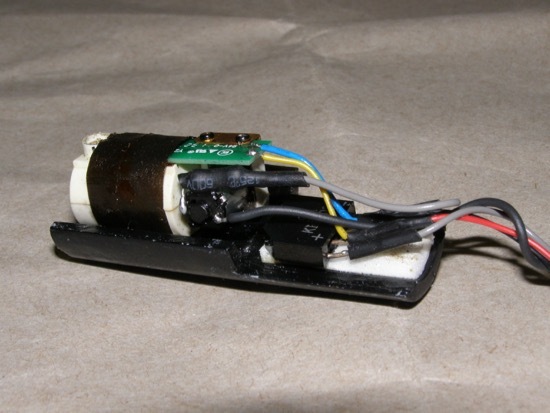 Also, because I am powering both forward and rear engines with can motors the distance between the engines is determined by the size of the forward can motor. 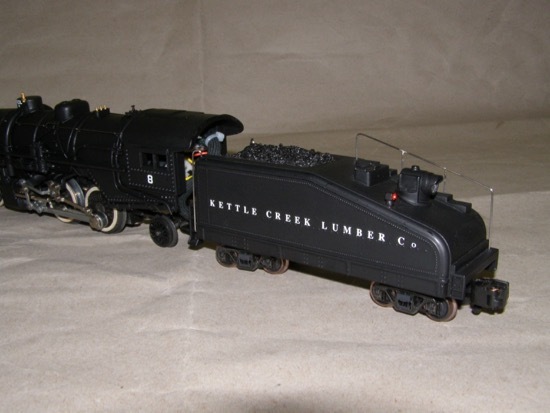 The story line for the engine I built runs like this: The Kettle Creek Lumber Company operates in the northern part of Pennsylvania in the area serviced by the Hemlock, Selkirk and Troy Railroad (my own railroad for which I have made some locomotives). 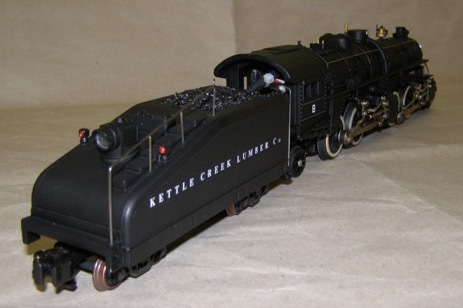 The KCL has an extensive operation and also uses some of the tracks of the HS&T. Over time it became apparent that the Shays and Climaxes (wish I really had some of them) the KCL used were too slow to really be effective when on the HS&T tracks, they were holding up the regular train service. 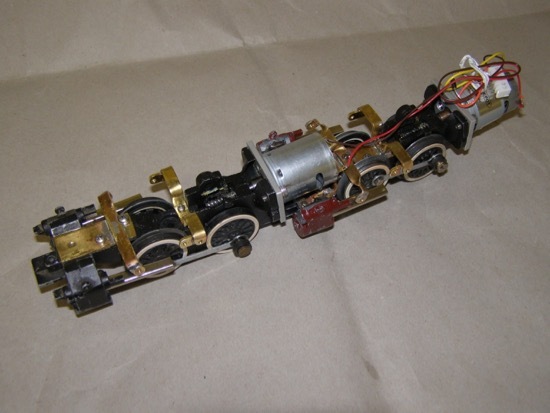 So, the KCL got together with the locomotive builders and designed an articulated locomotive that could service the KCL lumber operation (running over the more established trunk lines for collecting logs from the lesser feeders used by the geared locomotives). 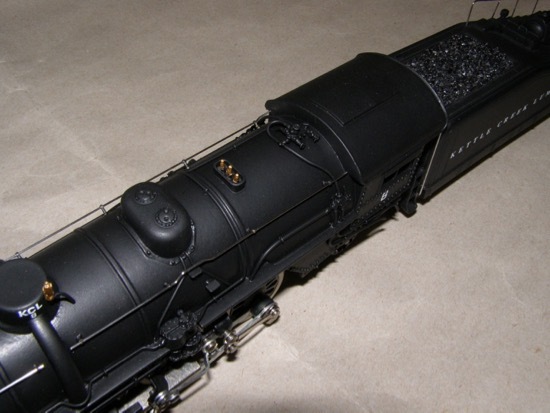 The rod engine could also use the HS&T rails and not hold up the regular service. 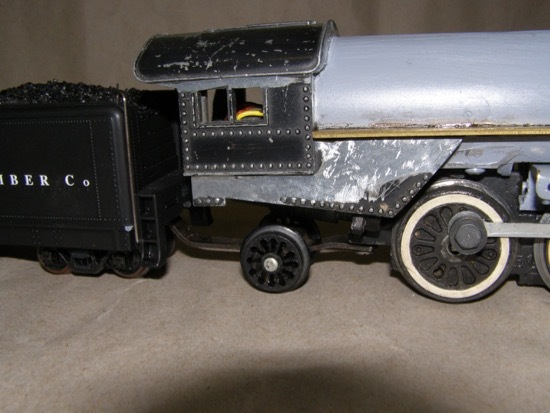 The KCL modified the small 2-4-4-2 made by Baldwin to fit its own needs, resulting in a similar but larger locomotive. 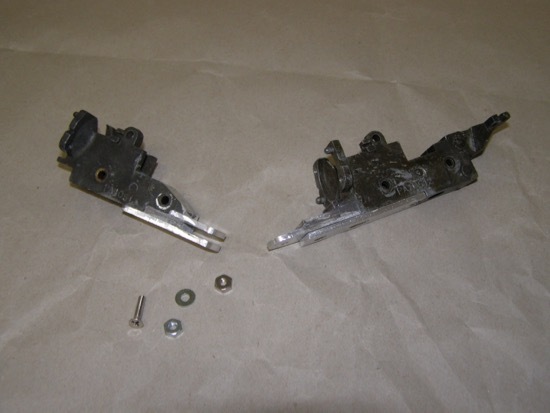 The model started out with two Gilbert Atlantic frames modified and joined together. 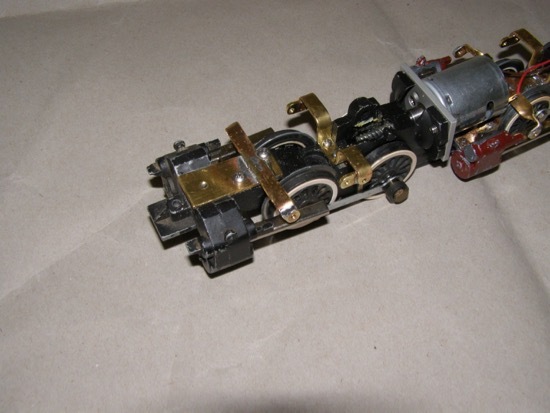 The frames are joined so that they are as close together as possible and still use a can motor (the shorter 0-8-0 version). After testing this arrangement to make sure it worked I started figuring out how to make the boiler. 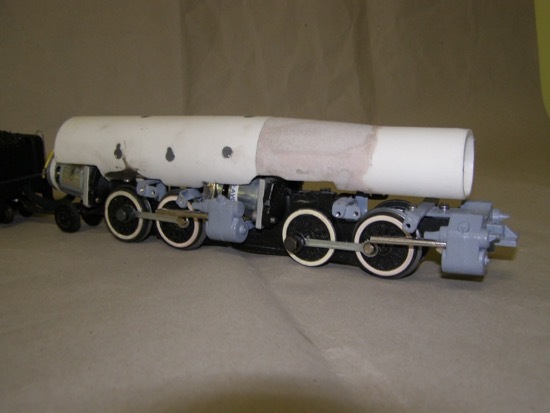 The boiler itself is two pieces of PVC pipe, one inside the other to make the boiler contours appear more realistic. 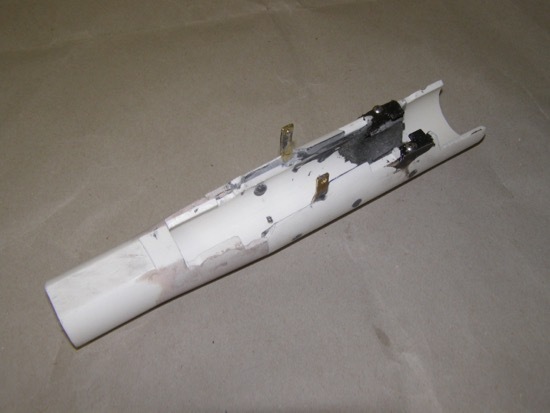 The step between the two diameters of pipe was filled in with Bondo. 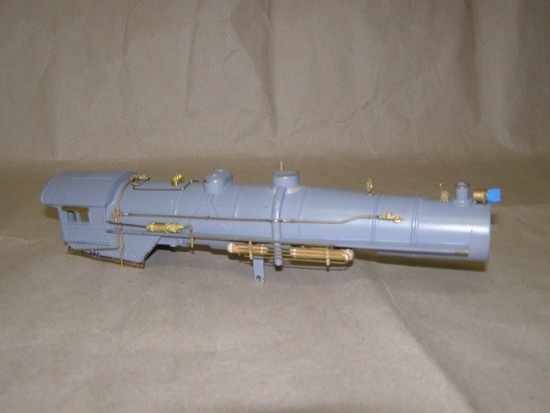 The mounting points for the boiler were also installed at this time. The running boards are brass strips. 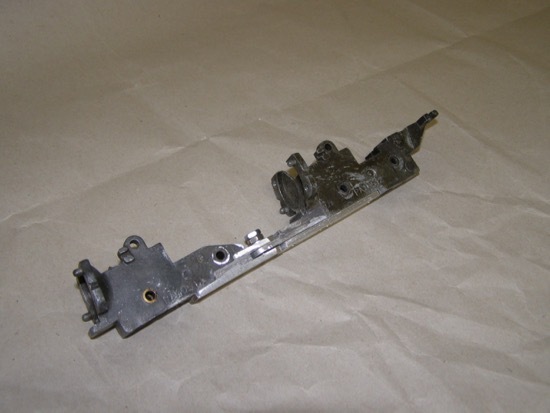 Brass castings are used for most of the details: smokestack, steam dome, sand dome, air pump, injectors (one on each side), check valves (also one on each side), power reverse, turret, bell, whistle, generator, headlight, ash pans, and handrail stanchions. The piping is brass wire of various sizes. 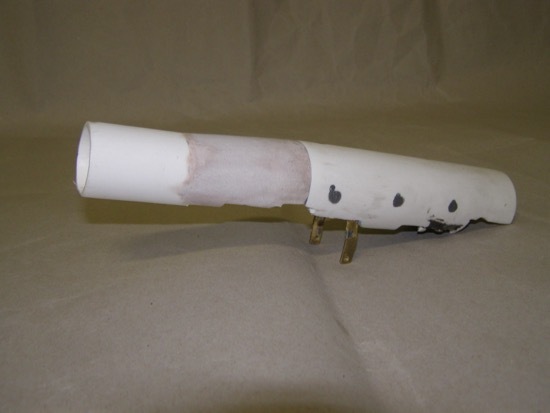 Piano wire is used for the boiler handrails. The cab is one removed from a Gilbert New Haven type Pacific, a No. 293. 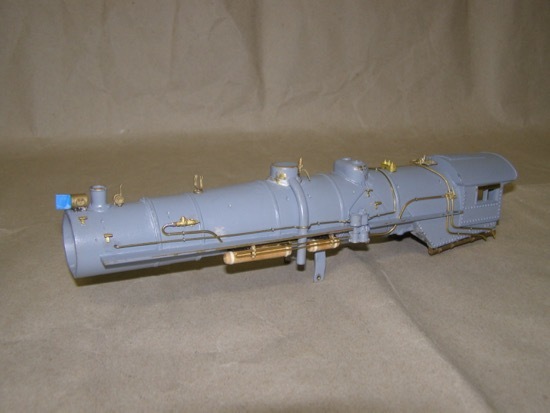 The boiler front is from a Gilbert Casey Jones type locomotive. The pilot is a Gilbert Atlantic type with a brass toolbox casting, platform and sandboxes for the front engine. The cylinders are Gilbert K-5 Pacific type, with a lot of modifications. 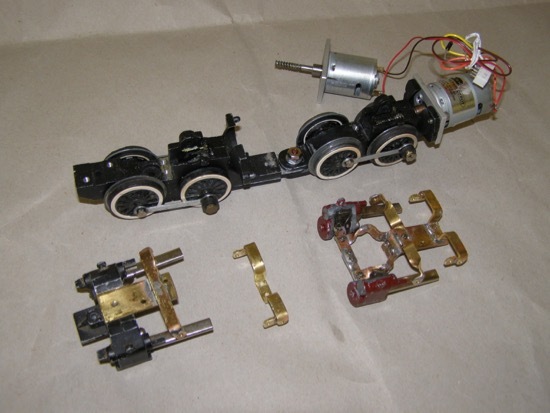 The drive rods and valve gear are modified Gilbert products. 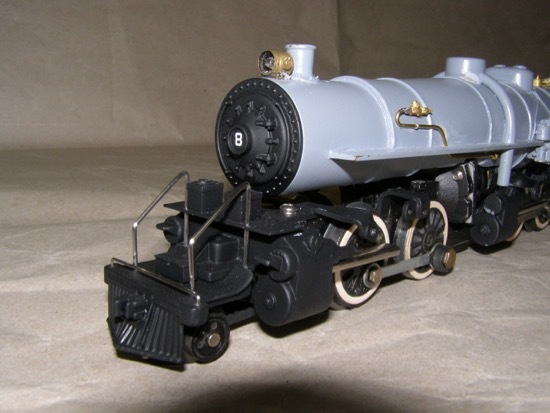 The tender started life as a Lionel O gauge model. 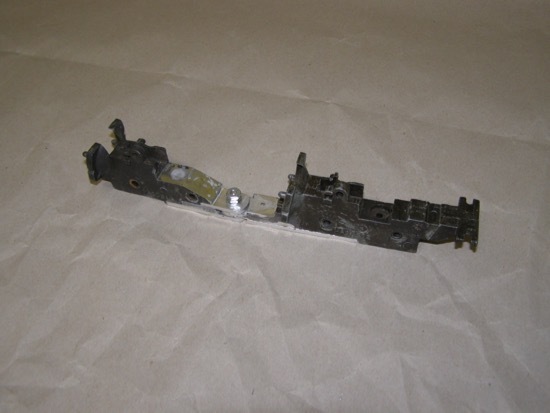 It was cut lengthwise, narrowed and put back together. 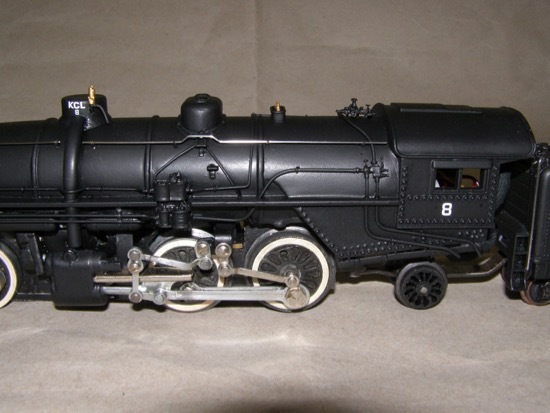 The locomotive has directional lighting for the headlight and tender light. 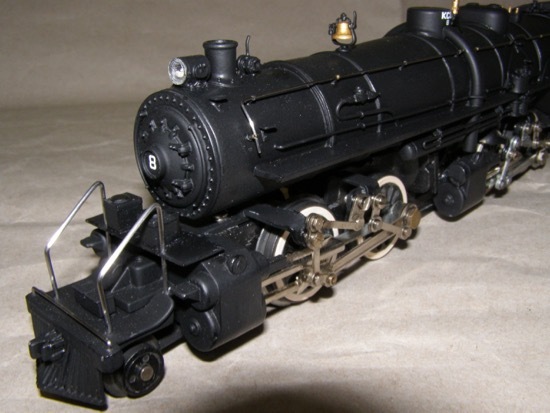 I used a Dallee electronic reverse unit, Electric Railroad Railsounds Commander (articulated locomotive version) for the chuffing and other engine sounds. Two magnets are used to give extra chuffs. 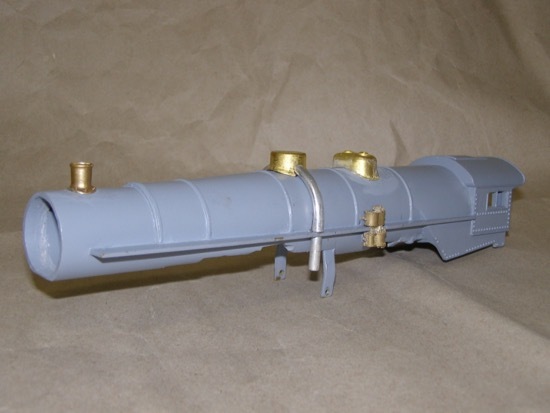 A MTH HO smoke unit is installed in the boiler, also using the two magnets for increased smoke pulses. 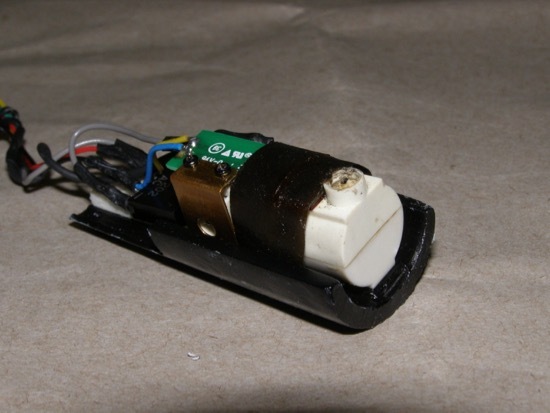 This arrangement required two reed switches to work, but they use the same two magnets (installed on the otherwise unused Gilbert smoke unit gear). The finished model turned out pretty nice and runs well. 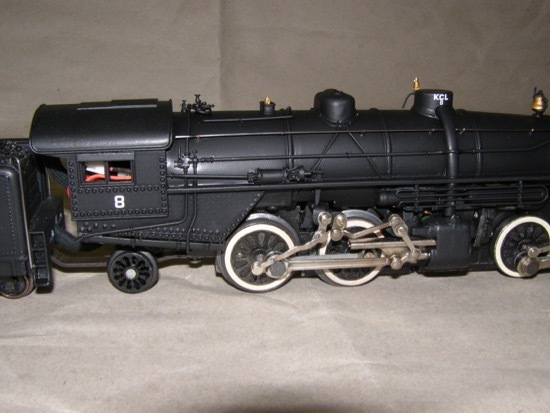 Again, a nice addition to my growing roster of locomotives.